Out My Front Door: Financial Fiascos ~ How Will I Win My War? Financial Fiascos ~ How Will I Win My War? For someone who doesn't like to cry, I got as close to a meltdown as I'd let myself. Several things have been happening lately, and it's gotten harder to stay positive. I know this seems like a turnaround from my previous posts lately, but at those moments it was a bit easier to stay positive. Like a lot of people, I struggle with being financially responsible. I don't save. I pretty much live paycheck to paycheck. While I have a good job, I'm not well off. For awhile there I managed to live on a part time job, making less than I do now, but I didn't have a car then, and no pets, and ate extremely modestly. I still eat rather modestly, but every since I started wanting to "build my credit score" and got a credit card, and then a car, things started to happen. More of, "Oh, I need to treat myself. Oh, this happened just put that bill on the credit card so you don't get a late fee." How do things escalate so quickly? The sucky thing was that I spent ALL of my tax refund this year getting out of credit card debt. I was glad. Then...again, a couple things happened and I had to get food with the card. And I was too embarrassed still to talk to my boyfriend about finances. He was always helpful, taking care of us in ways, but I didn't show him how much I was struggling with bills and food. Feeding us both. Stupid me. Let there be financial clarity between you and your significant other. It will ease the burden, at least. It can only help. So after awhile I started being more open with him. Showing him what I was doing with my money, trying so hard every paycheck to put as much money towards debt--then, since I wasn't paying myself, giving myself spending money, I'd end up using the card for something. One of my cards. I have five now. One I rarely use, and I have no balance on it. The others have their designated uses, and then...whatever I choose for them. He started helping me put money towards the cards, helping balance out the grocery budget, less spending going out to eat. It's been hard. But I have learned something I used to scoff at, because I'm a "hit hard, everything goes" person. People work hard. We need that little treat. I give myself $30 off of every paycheck now. Yes, that's little, but in the scheme of getting out of debt as soon as possible, it's the more reasonable option. If I struggle to much, then I might increase it a little bit. As long as I'm paying more than the minimum on my cards. It still slip up and get greedy. I rarely go out with friends, and this past Thursday I had the opportunity. I had no personal spending money left, and it was the day before payday. So I used my card. I didn't even spend a lot. A modest fast food meal, some deals at Hot Topic and Forever 21. Genuinely small things. But the reality is, now I don't have that spending money for these two weeks, because I spent it on the day before. I immediately put my allowance towards the card, since I technically already spent it. It's hard being stretched thin. Back in April/May I finally went to the doctor, and asked for meds for my sciatica. I've struggled with it more and more this past year, so I asked for the declined meds (that I got from the hospital physician) to be approved. One of them was a good painkiller that whenever my back started interfering with my work, would make it go away. I'd be able to keep working. I found out that the specific mix of prescriptions that he gave me put me at risk for seizures. Go figure. She said no to the prescriptions of course, gave me a new one, and signed me up for physical therapy. Yay to getting myself fixed. I had no freaking idea how much that would cost. I called ahead, and got an estimate. Way off. WAY OFF. I got another bill yesterday, after when I thought I had the final balance to everything after insurance and my financial aid, and was like, "Wait, what??" So I called. No. That balance was for one freaking appointment. I'm going to be in even bigger debt than I imagined. Just for five days of some cute exercises and 8 minutes of electric therapy on my back. I hung up and could feeling the meltdown coming. I was so tired of being in debt. Tired of trying to get to the point where I could save money for whenever I get married, want to go on a honeymoon. Pay for freaking school. It's like I get setback after setback. If I wasn't in credit card debt (which all things considered, I'm handling ok) this would still put me right where I am with it. Heaven help me. And I'd like to be able to afford to go on a road trip. This year's was canceled due to expenses. Credit card debt is in an uncomfortable place. My car loan, which is taken care of every paycheck, is a rip off APR-wise and final cost-wise. It's worth $1500, I got it for over $8k, and by the end of this financial plan I'll end up paying over $13k. Good grief. Health bill I don't know what the final balance will be yet. Online classes, roughly $220 a month. Car repairs--already spent $2k on it after a wreck, and then the starter wouldn't work. So there's that. Back down to one (functioning) car. Needless to say I was overwhelmed yesterday. I had had about enough. Enough worrying about debt, about work, about how I was going to succeed at being self-employed within two years. In the end, no matter the cost to time it is, it comes down to facts. Like Captain Jack Sparrow says, it's about what a man can do, and what a man can't do. (A nerd finds wisdom in the strangest of places, don't judge me). I can't make it disappear overnight. Or in a month. I can however just look at what I'm willing to budget, and stick with it for however long it takes. One step at time. Because wanting to punch something so hard you burn, doesn't fix anything. Looking at the facts does. Calmly setting down a feasible plan does. It will take more time. 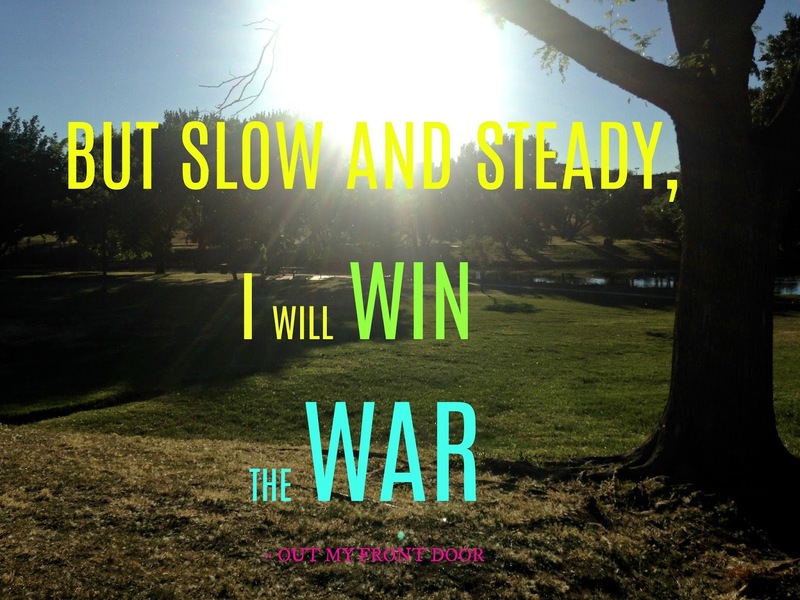 But slow and steady, I will win the war.